Embrace the beauty of nature with PANDORA's striking assortment of sterling silver bands. Smooth strands of silver are expertly entwined with glittering cubic zirconia highlights. 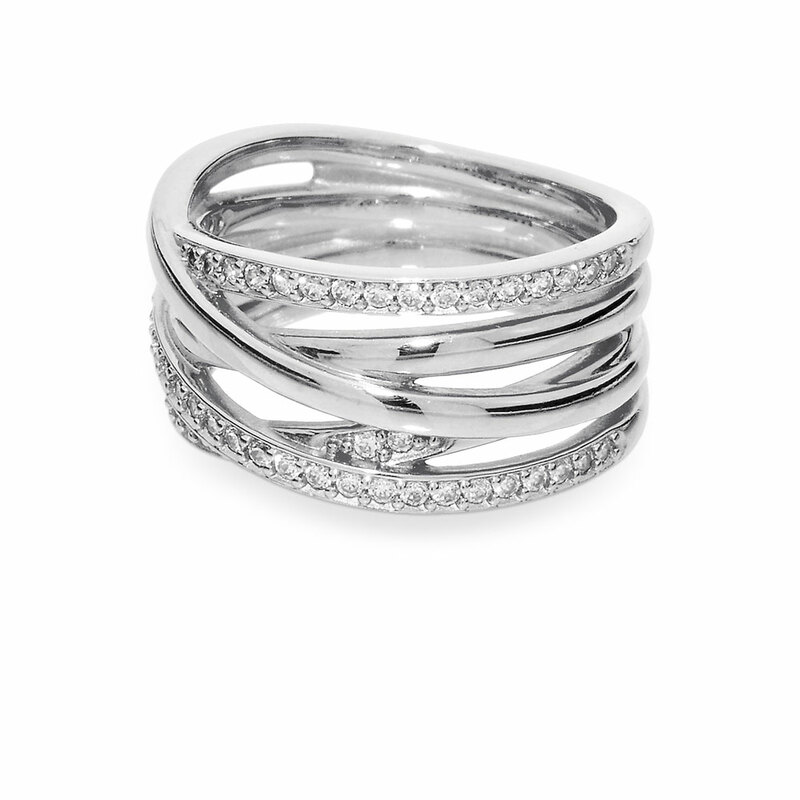 A modern statement ring that will upgrade any outfit. Eternity Entwined Silver & Zirconia Ring - PANDORA is rated 4.5 out of 5 by 64. Rated 5 out of 5 by Victoria from Beautiful ring I bought this ring several months ago for my ring finger on my right hand, I absolutely love this ring it is my favorite, it's still very shiny, I love their ring cloth cleaner, it's so awesome a few swipes and it's shines like new!!! Rated 5 out of 5 by JulieM from Love this ring This was bought as part of a Christmas gift and I love it. Rated 5 out of 5 by LisaJ from Beautiful Ring My husband & children gave me this ring for Christmas. I just love it! It is beautiful, and I always receive many compliments! I wear it on my middle finger and it looks & feels great! Rated 5 out of 5 by LABB929799 from My story in a ring. My husband and daughters gave me this ring for Mother's Day (after several hints from me). I LOVE this ring and wear it every day on my middle finger. For me the ring symbolizes my children. There are two solid bands that wrap around the ring and three "broken" bands. I have two daughters and three children lost to miscarriage. It symbolizes our family perfectly. Pandora is all about your story. This ring is my story in a beautiful piece of jewelry. Rated 5 out of 5 by Beth from Entwined Ring Absolutely love this ring! I received it as a Christmas present from my husband and daughter. It is a perfect weight and design. I receive many compliments and wear it everyday! Rated 5 out of 5 by Petitevivie from I love this ring! This is my only pandora ring so far and I love it, it fits so nice and I get a to of compliments on it .would recommend it to everyone.thank you for your beautiful jewelry. Rated 1 out of 5 by melmar from disappointed I absolutely loved this ring when my husband gave it to me this past Christmas. I have exchanged it twice, due to stones falling out. Ring #3 currently has 2 stones missing. This ring was not worn everyday. Rated 1 out of 5 by Jdel from Beautiful Ring BUT... I bought this ring for myself two months ago, and already 4 stones have fallen out. Very disappointed.